In the early 1970s fully poseable 8” action figures from Mego Corporation ensured the toy manufacturer’s dominance for a large part of the decade. The company produced a series of action figure toy lines for films, as well as Marvel and DC superheroes. Buoyed by an endorsement and exclusive license from the Boy Scouts of America, Kenner threw its hat into the action-figure ring with its release of official scouting figures and themed play sets in 1974. Steve Scout and Bob Scout -two 9.5” action figures dressed in Boy Scout uniforms fully articulated with “action arms” – backstopped the initial series from Kenner. A second series in 1975 brought Craig Cub and Dave Cub – 8.5” action figures dressed in Cub Scout uniforms – into the fold. The appeal of action figures for kids was that they could recreate events that they could not do in real life. But the Scouts was an easily accessible social organization that already had a presence in most towns and cities across the United States. Kenner addressed this marketing challenge with a strategy that can be summed up in two words: HIGH ADVENTURE. The Scouts action figures transcended the organization’s real-life mandatory camping trips, community projects, and merit badges through a series of high-adventure play sets that saw them battling inclement weather, scuba diving in search of sunken treasure, hang-gliding, and participating in hot-air balloon races. Each adventure play set came with a mini-comic book. Check out the flip book below to get a taste of their high-flying exploits. 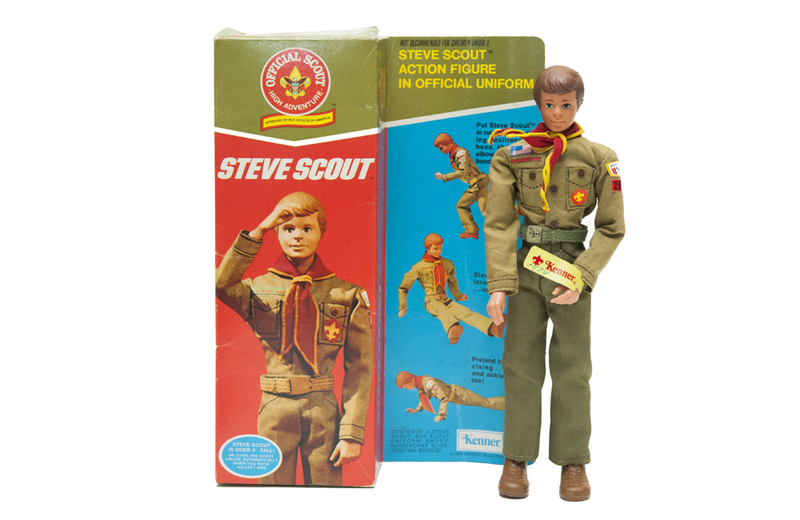 Unfortunately, Steve Scout and friends failed to make a dent in the competitive action figure mark, forcing Kenner to discontinue the line after two years.